The Elemech lives in the Zarlin Catacombs. He likes fruits and used to buy them from a bear living in the Catacombs. However, one day the bear tires to sell him rotten fruits and he proceeds to chase the bear until the bear is shot in the chest by Sergio Fabioso. The Elemech goes over and thanks Sergio and the party for the help. However, Sergio offers him "fruit", but instead takes him to the corners and "tries to molest him". This angers him and things are not made better when No-Eye Bromas becomes confrontational. He quickly gets into a fight with the party. He starts off by activating his camouflage but is quickly discovered when Fantastico Fabioso throws ash in his direction making him visible again. He is then pinned to the ground with Honor chains and starts begging for his life and offers the party a gemling. When they released him he threw the gemling and ran out of the room never to be seen again. 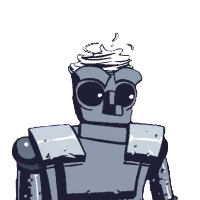 This unnamed NPC is your average, run of the mill Elemech. He tells it like it is, and is relatively forgiving. But if annoyed he will quickly become snarky, defensive, and even begin to threaten others. This Elemech had a "Predator-like" cloaking device that made him near invisible. He seemed to dislike "Johnny Cuckoo", a purple robot that can teach people how to use the Mind Fist ability. This page was last modified on 30 March 2018, at 13:13.